What is hard for any new DJ, is to get their name out there and no one has done it quicker or bigger than our smallest and youngest little DJ, Louisa. At 8 months old, she takes to the decks (or rather Pioneer CDJ 2000 nexus) like a boat to water. From scratching to tapping play to giggling at her headphones falling off, she loves every bit of it. 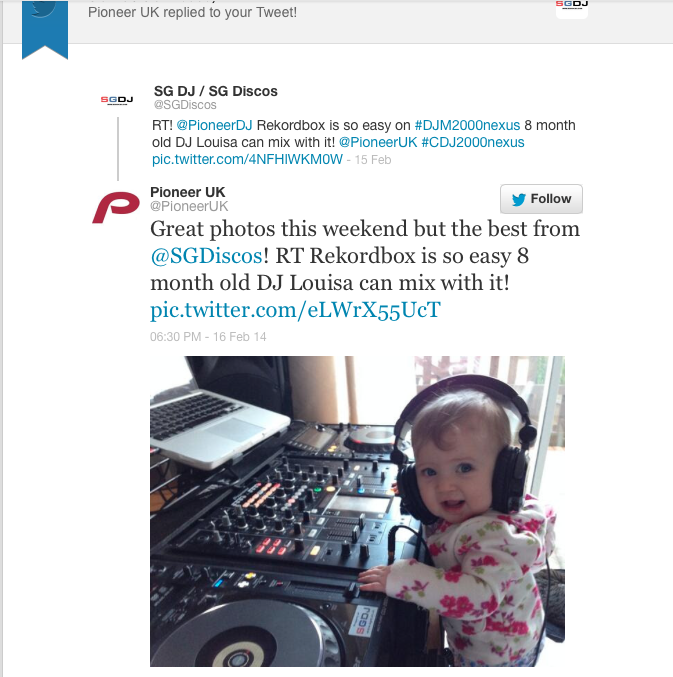 On the weekend I managed to get a photo of her in the mix and put it up on our SG Discos twitter page. It was not long until it was rewetted and shared across the world and later even mentioned by Pioneer DJ. Now if you don’t think she is really taking it seriously enough, then think about this, when taken away from the mixer she began to cry and in front of the controls she couldn’t stop laughing. Not only this, she was very careful with her milk and even managed to be sick (I was very worried for the equipment when that happened) away from the Pioneer CDJ’s, which obviously makes me happy as the equipment she was playing worth was worth in the region of £5000! This is possibly the cutest picture I’ve ever taken of a DJ, far better than any of my selfies (I don’t take those. Seriously I don’t!). DJ Louisa is one to look out for, I will try and get some videos of her soon!